Cleaning up old documents may not be on par with having 20 cords of seasoned hardwood or a bug-out bag ready to go. But good organization is simply smart. Spring cleaning doesn’t necessarily mean getting the yard tidy, taking care of winter’s buildup in the house or working in the garage or shed to toss out accumulated junk. Proper filing of necessary home documents and shredding or burning old ones sounds dull. But it’s a smart task that in today’s time of identity theft could prove to be a helpful chore. Cleaning up your home office or corner nook where papers have accumulated is worth the time, as is getting into the habit of properly discarding old documents. I took some time during a recent cleaning day around the house to shred a pile of documents. These included, to my amazement, some that were seven and eight years old. Many of the accounts were closed or had been transferred to newer ones, with new records and account numbers, but I was dismayed at my laziness in letting all these accumulate. If you have a way to burn old documents, that would be my first recommendation. A fireplace, a patio chiminea, maybe a burn pile in your yard, and once they’re up in smoke they’re gone. If not, a stout paper shredder is a good idea to have and use. I’ve had one for more than a dozen years (and will be putting it to use more frequently). Buy a shredder applicable to your needs. If you don’t need one with a bunch of bells and whistles, don’t buy one. Shop around. Look online for positive reviews, like in Consumer Reports. Study the models for durability and what kind of ability they have – paper, card stock paper, etc., and purchase locally at an office supply or retail store, or buy online. With documents, some of them you need to keep and many can be discarded. Those to keep may include tax records or annual filings, pay stubs from the last couple of years for tax purposes and insurance statements if you’re filing a claim or are involved in a legal matter. Home purchase or lease records, of course, as well as vehicle or other major purchases or leases. I’ve kept records about paying my speeding tickets (I’ve had a few) for at least three or four years, just in case something came up and I needed to prove I’d paid them. Everyone will have different ideas about what to keep and what can be tossed. If you have a tax or financial advisor, check with them for their advice about keeping old records. They should be able to offer some advice about what kind of and how long to keep documents. With our documents, I look for contract numbers, account numbers, bar codes, old bills that may have account or banking information — anything with a number or personal info. If I believe it has something that someone could somehow use to create problems for me, it goes through the shredder. As for the necessary items — home mortgage, car purchases, land or other major purchases or leases, financial records — consider purchasing a safe or lockable filing cabinet. Make sure your spouse knows how to get to those records. If you have a safety deposit box at the bank, consider making photocopies or digital copies to store there (or somewhere else you deem safe). I know some folks also will make videos of their home, inside and out, to have a record in case of fire or robbery. It’s easy to remember some of the big or sentimental things but all of the little things – books, other valuables, outdoors gear, cameras, etc. – all add up when you’re filing an insurance claim. I’d rather have the peace of mind knowing the necessary documents we have are secure and anything else isn’t easily available for some slimebag who might try to fiddle with our finances. 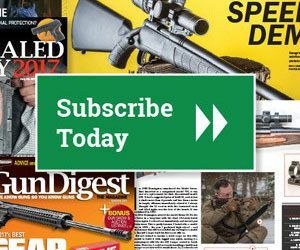 Alan Clemons is the Southern Managing Editor for Deer & Deer Hunting, an F+W Media property and a sister publication to Gun Digest.